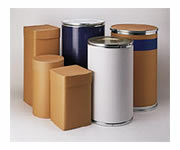 Call us today so our qualified sales specialists can assist you in making wise container choices! 30 gallon Plastic and Steel. Open and Closed Tops. 55 gallon Plastic and Steel. Open and Closed Tops. Rieke or Tri-Sire. Plain lids, 2x3/4", specialized lids, agitators. 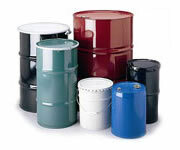 Overpacks 85 and 95 gallon plastic and steel Overpack drums generally used for secondary containment of smaller containers in case of spills or leaks. 15 GAL 1h1y1.8/200 c/h BLUE 8# 16 x 22 1"x3/4"
Pails are made of HDPE and come in most sizes from 1/2 gallon, gallon, 2 gallon, 3-1/2 gallon, 4-1/4 gallon, 5 gallon, 6 gallon, Standard colors available are natural, white and blue. 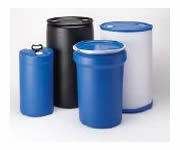 There are various fitments for the covers of the round pails, tight head round and square containers. H: 13 3/4", L:11 3/8" W:10 1/2"
H: 13 7/8", Diameter: 12"
Shipping Cube: 12 cu. ft.
H: 231/4", Top: 145/8", Bottom: 145/8"
H: 303/4", Top: 14 5/8"Bottom: 14 5/8"
Cube 30 Gal: 6.6 cu. ft.
Cube 35 Gal: 7.5 cu. ft. Bagged to keep clean in transit. One two inch BTS closure and one two inch NPT closure with 3/4" NPT insert. Accomodates both vented and non-vented plugs and/or takeout equipment. The solid top ring of this drum provides continuous protection and mechanical strength. It features 360 degree handling approach and is compatible with all conventional steel drum handling equipment. Tough stackable design for long life and durability. Allows maximized shipping container utilization. One two inch BTS closure and one two inch NPT closure with 3/4" NPT insert. Accomodates both vented and non-vented plugs and/or takeout equipment. 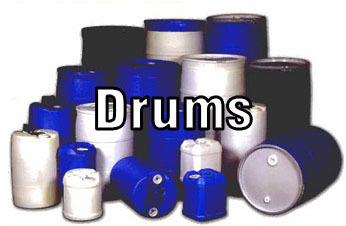 The solid top ring of this drum provides continuous protection and mechanical strength. It features 360 degree handling approach and is compatible with all conventional steel drum handling equipment.